Time flies, I can’t believe the end of September is upon us! Weeks have flown by and I have started several posts without finishing them (yes, you can slap my hand for me). Fall baking has begun at my place (recipes to come)….along with my craving for all things goat cheese. Let’s just say the combination of goat cheese and sun-dried tomatoes is a serious weakness of mine. I’m not sure why I hadn’t discovered this luscious combo in my earlier years…unless my palate wasn’t quite refined enough to appreciate the flavor explosion those two ingredients create when paired together. Sprinkled on salads, smeared on crackers, served on/inside/alongside chicken and cooked with omelettes, goat cheese and sun-dried tomatoes may go together as well as…dare I say…chocolate and peanut butter? OK, I won’t stretch my luck for those of you who aren’t yet convinced on goat cheese, but the pairing has definitely won over this foodie! 1. In a small bowl, whisk together eggs, egg white, splash of milk/water and black pepper and set aside. 2. In a medium skillet, add 1 tsp oil over medium heat. Add mushrooms, sprinkle with sea salt and saute until golden brown (about 5 minutes or so), stirring occasionally. Remove from pan and cover to keep warm. 3. Add remaining 1/2 oil to pan and swirl to coat. Whisk eggs again briefly before adding to pan. 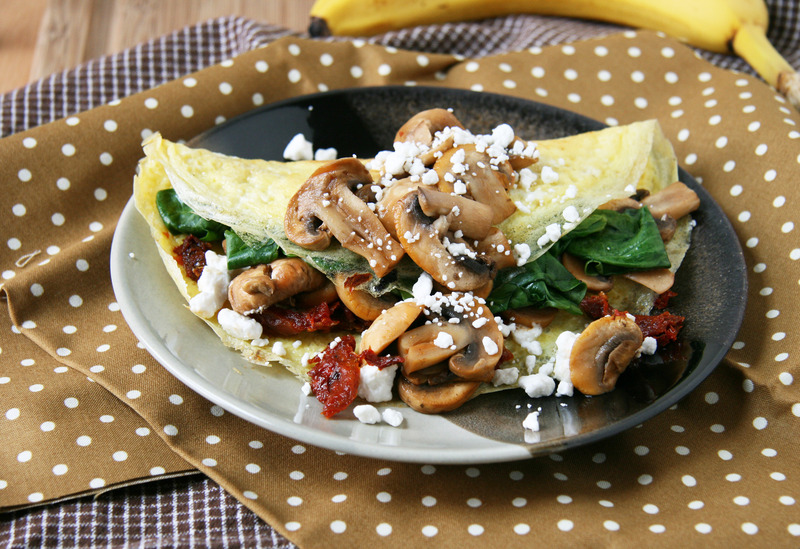 Pour eggs and swirl around pan to coat evenly. Cover and let cook for 2 minutes then *sprinkle or lightly spray with a couple drops of water (this helps moisten the omelette!) and cover again and cook until almost set and cooked through (another 2-3 minutes). 4. 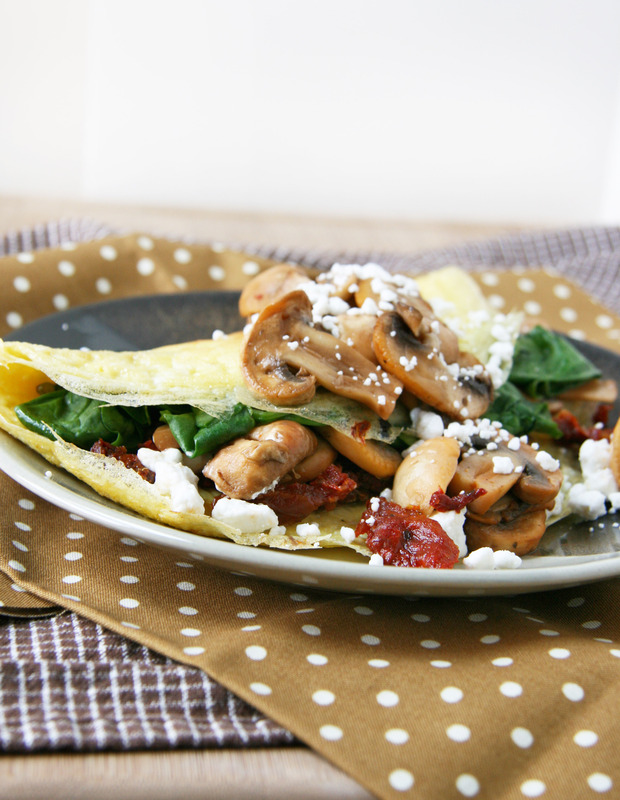 Add spinach, sun-dried tomatoes, goat cheese and half of the mushrooms on half of the omelette and fold over and gently side onto a plate. 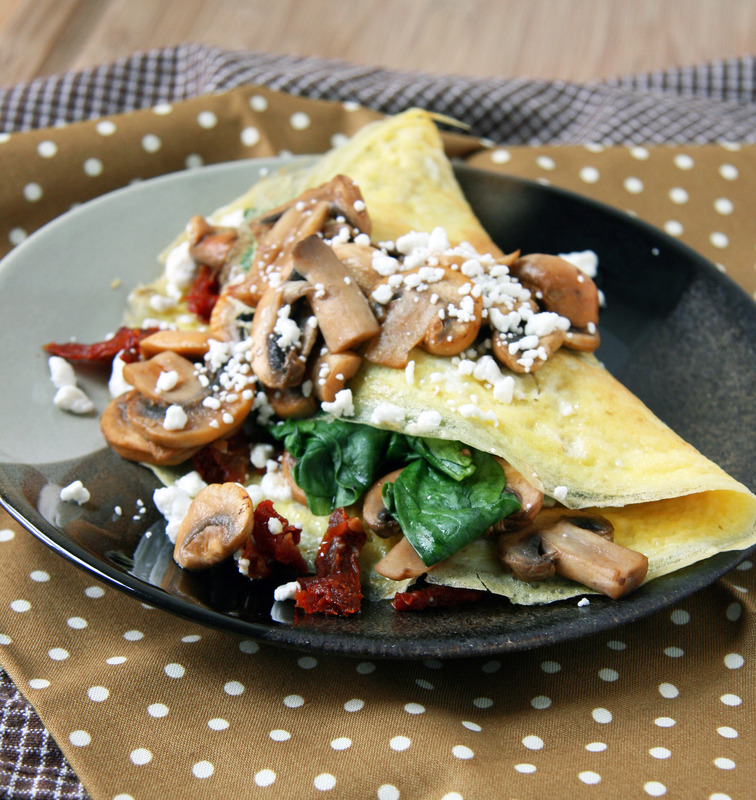 Fold over the other side on top of the filling, garnish with remaining mushrooms and an additional sprinkle of goat cheese if desired. Enjoy immediately! Note: If you want your spinach more wilted, add them to the pan after you saute the mushrooms for a minute or so and cover to keep warm before adding to filling. This sounds divine!!! And I must say that polka dot napkin is adorable! It tastes divine too, I promise! I love the polka dots too 🙂 I couldn’t resist when I saw it at the store! Thanks so much Shira! 🙂 Always such a compliment coming from you! Boy, do I MISS you friend!! Just wanted to stop by and send you some love. XOXO!